Through naval gunfire and demolition parties, 18,000 tons of shipping were sunk. Perhaps the most significant outcome of the raid was the capture of a set of rotor wheels for an Enigma cypher machine and its code books from the German armed trawler Krebs. German naval codes could be read at Bletchley Park, providing the intelligence needed to allow Allied convoys to avoid U-boat concentrations. In the aftermath, the evaluation of the operation differed, with the British, especially Winston Churchill and the Special Operations Executive, deeming it a success. In the eyes of the British the main value of such actions was to tie up large German forces on occupation duties in Norway. 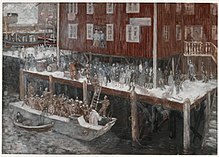 Martin Linge and the other Norwegians involved were more doubtful of the value of such raids against the Norwegian coast but were not told of the value of the seized cryptographic information. Following Operation Claymore, the Norwegian special operations unit Norwegian Independent Company 1 was established for operations in Norway. Operation Claymore was the first of twelve commando raids directed against Norway during the Second World War. The Germans eventually increased the number of troops in Norway. By 1944, the German garrison in Norway was 370,000 men strong. A British infantry division in 1944 had an establishment of 18,347 men. No. 3 and No. 4 Commandos, would become part of the 1st Special Service Brigade that took part in the Normandy landings in June 1944. After the successful completion of the mission, Prime Minister Churchill issued a personal memo "to all concerned ... my congratulations on the very satisfactory operation". 1 2 West 2015, p. 10. ↑ "The Royal Navy during the Second World War: A6801 (photograph)". Imperial War Museum Collection Search. Imperial War Museum . Retrieved 5 July 2010. 1 2 3 4 "No. 38331". The London Gazette (Supplement). 22 June 1948. p. 3687. 1 2 3 4 5 "No. 38331". The London Gazette (Supplement). 22 June 1948. p. 3688. 1 2 3 "No. 38331". The London Gazette (Supplement). 22 June 1948. p. 3689. Roskill, S. W. (1957) . Butler, J. R. M., ed. The War at Sea 1939–1945: The Defensive. History of the Second World War, United Kingdom Military Series. I (4th ed.). London: HMSO. OCLC 881709135 . Retrieved 7 May 2018.